I LOVE YOU………..The term I love you in English is normally used as a term of affection or endearment towards people you are close to such as family,spouses, children and close friends. In American Sign Language, the sign for I love you is used as an affectionate term as well but now more often used as a casual sign to mean farewell, take care or until we see each other again phrase. 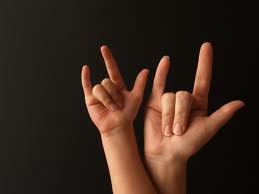 The “I Love You” sign has become increasingly popular within the hearing community and the ILY symbol is seen everywhere! Products sold for Valentines Day, T-shirts, Pictures and more. So, in honor of Valentine’s Day don’t forget to use the I Love You sign to tell friends and family in a different language how much you care for them or even as a sweet and loving way to say goodbye. I saw a great video about the use of ILY. Take a look.